Also see analysis of the impact of a delayed buildout on indirect displacement. On 7/26/06, analyzing the Socioeconomic Conditions chapter of the Draft Environmental Impact Statement--the first major document dump regarding Atlantic Yards--I found a major flaw in the state's claim that the project would not cause people to lose their apartments because of rising rents (aka gentrification). I didn't check a few months later to see how, in the Final Environmental Impact Statement, Empire State Development Corporation (now known as ESD), revised the analysis, essentially acknowledging the flaw but finding a different way to reach the desired conclusion. The upshot: after misleadingly claiming that the housing in Atlantic Yards would be similar in affordability to the housing already in the ¾-mile study area, ESD instead said the new housing would not "substantially change" the socioeconomic profile of the area. Maybe, but those are two very different things, since there's a lot of dilution possible in an area with more than 130,000 people. Also, as I describe below, "substantially change" contains a lot of wiggle room. Atlantic Yards was projected to be part of a 56% increase in the wealthiest cohort, compared with the study area as of 2000. That didn't count for the state's analysis. Rather than compare the results with Atlantic Yards with the baseline in 2000, they compared it with the scenario, given ongoing gentrification, if the project wasn't built. In that estimate, the Atlantic Yards buildout would cause a 19% increase in the wealthiest cohort. That wasn't deemed substantial. The environmental review was the product of the ubiquitous firm AKRF, whose Atlantic Yards tab is now some $7.7 million. As it happened, AKRF vastly underestimated the pace of gentrification, as I show below. As I wrote, the DEIS said there wouldn't be indirect residential displacement, in part because of ongoing gentrification threatening the 2929 households potentially at risk, because new housing units could relieve market pressure, and because most of the at-risk households would be more than a half-mile away. It said "existing upward trends in residential property values and incomes in the study area indicate that the at-risk population is likely to decrease in the future with or without the proposed project." Indeed, rents in Prospect Heights and Bedford Stuyvesant--the two subareas containing a majority of the households identified as potentially at risk of indirect displacement—rose by some 25 percent between 1990 and 2000, and rents were still rising. ... the housing introduced by the proposed project would be similar in tenure (owner vs. renter), size, and affordability to the housing mix in the ¾-mile study area, indicating that the socioeconomic profile of the new residents would not be markedly different from the profile of existing residents in the study area as a whole. However, households earning $50,000 (or $55,000) would have a chance at only 16 percent of the 6860 apartments then planned for the project. A large majority, 4610 units, would be market-rate condos and rentals, likely geared to people earning six figures and more. Then, of the 2250 subsidized units, about half would go to households earning more that $50,000 (or $55,000). That meant that nearly 84 percent of the new households would not be similar economically to current residents, and only 16% would be similar. The distribution of affordable and market rate rental units would also be similar on the proposed project site and in the ¾-mile study area. A housing unit is generally considered “affordable” if the household occupying it pays 30 percent or less of its income towards housing costs. As of the 2000 Census, approximately 59 percent of all renter households in the ¾-mile study area were spending less than 30 percent of their household income on housing costs. This is similar to the proportion of affordable units planned as part of the proposed project. But that doesn't mean they'd be affordable to the same group of people. If the median household income in the study area was $50,000, the affordable rents back then were much lower than the affordable rents that most Atlantic Yards renters would pay. In tenure, affordability, and apartment size, the housing stock introduced by the proposed project would be similar to the housing stock in the broader ¾-mile study area. This indicates that the socioeconomic characteristics of the new population (e.g., in household income and household size) would be similar to the characteristics of the population living in the broader ¾-mile study area. Therefore, while the proposed project would introduce a substantial new population, that population would not be markedly different in its socioeconomic profile than the existing population, which would eliminate one of the underlying conditions for indirect residential displacement. Actually, evidence suggested household income would be different, not similar. By ignoring income figures and relying on affordability as a proxy for income, the DEIS misread "indirect residential displacement." Finally, the size of the units introduced by the proposed project (defined by number of bedrooms) would be similar to the existing housing stock in the ¾-mile study area. Under either of the proposed project’s variations, 50 percent of the 2,250 affordable rental units would be studios and one-bedroom apartments and 50 percent would be two- and three-bedroom apartments. According to the 2000 Census, 53 percent of the rental units in the ¾-mile study area are studios and one-bedroom apartments, and 43 percent are two- and three-bedroom apartments. (The remaining 6 percent of apartments have 4 or more bedrooms.) In tenure, affordability, and apartment size, the housing stock introduced by the proposed project would be similar to the housing stock in the broader ¾-mile study area. Actually, 50% of the affordable rentals, in floor area, were supposed to be two- and three-bedroom units, as acknowledged in the Executive Summary of the Draft EIS (p. S-4) and as a goal in the Community Benefits Agreement. But family-sized units are larger than studios or one-bedroom apartments. Even if that 50% floor area goal were met, I estimated in August 2006, only 36% of the units would be two- and three-bedroom units. That's way different than the 49% family-size units as noted in the census. As we now know, that 50% goal is far off in the first tower, though Forest City's housing partner says the next buildings will have a better ratio. So, actually, it was wrong to say the new Atlantic Yards housing stock introduced would be similar in terms of affordability and apartment size. Similarities between the proposed project housing mix and the housing mix currently present in the ¾-mile study area indicate that the proposed project would not substantially change the socioeconomic profile of the study area. Note that "not substantially change the socioeconomic profile of the study area" is not the same thing as saying, as in the Draft EIS, that "the socioeconomic profile of the new residents would not be markedly different from the profile of existing residents." The likelihood that Atlantic Yards would not substantially change the profile of the study area had more to do with ongoing gentrification than a similarity between the new Atlantic Yards households and the existing cohort of residents. As described earlier under the preliminary assessment for indirect residential displacement, one of the conditions that can cause indirect residential displacement is if a proposed project would introduce a population with socioeconomic characteristics that are different than the characteristics of the existing population. Although it is impossible to predict the exact demographic characteristics of the households that would move to the project site under the proposed project, an assessment of the proposed housing mix indicates that the new population would not have markedly different socioeconomic characteristics than the existing population in the ¾-mile study area or the population expected to be in place in the study area by 2010 and 2016. As described earlier under the preliminary assessment for indirect residential displacement, one of the conditions that can lead to indirect residential displacement is if a proposed project would introduce a substantial new population with different socioeconomic characteristics compared to the size and characteristics of the existing population. Although it is impossible to predict the exact demographic characteristics of the households that would move to the project site under the proposed project, an assessment of the proposed housing mix and the anticipated incomes for the new households indicates that the introduction of the new population would not lead to substantial shifts in the overall socioeconomic profile of the study area. That ignores the existing population and focuses on the new population. In other words, adding some 13,500 new residents would not lead to substantial shifts in a study area that included 130,057 people. That may be debated--see below--but that's not the same as the claim in the earlier document. The size of the units introduced by the proposed project (defined by number of bedrooms) would also be similar to the existing housing stock in the ¾-mile study area. The Final EIS continued to say that "the distribution of affordable and market rate rental units would be similar on the proposed project site and in the ¾-mile study area," given that 59 percent of renter households in the ¾-mile study area were spending less than 30% of their household income on housing costs. The document compared the probable impacts of Atlantic Yards with the impacts without the project and concluded that there would be little difference in the proportion of households in each income group. 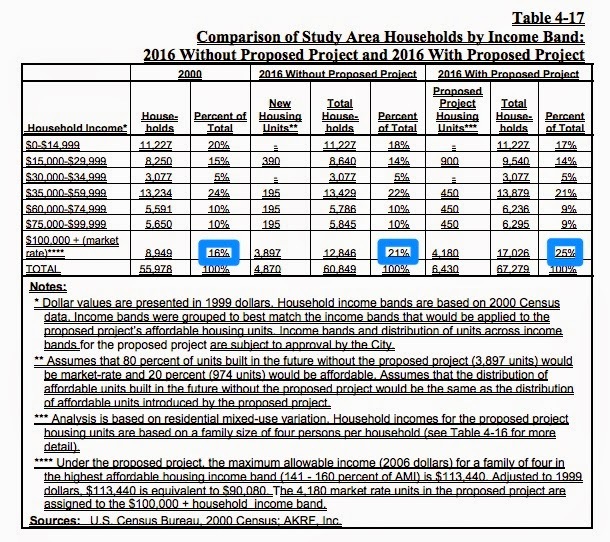 At the same time, while the number of households earning over $100,000 (representing, in 1999 dollars, households in market rate housing units) would increase by approximately 33 percent, these higher-income households would represent a similar share of total study area households in the future without the proposed project and the future with the proposed project. In total, the estimated share of households earning over $100,000 would increase by 4 percentage points, from 21 percent to 25 percent of study area households. Such relatively small shifts in the distribution of households across income bands would not be enough to substantially alter the socioeconomic character of the study area. Hold on. There's a difference between percentage used to represent fractional share of the total, and a percentage increase. I'm not sure where they get 33%. An increase in the wealthiest cohort from 16% to 21%--see chart at right-- may be five percentage points, but represents a 31% increase. An increase from 16% to 25%, or nine percentage points, means a 56% increase. Even the increase of four percentage points, from 21% to 25%, represents a 19% increase from the base. That's what they called "relatively small." Similarities between the proposed project housing mix and the housing mix currently present in the ¾-mile study area indicate that the proposed project would not substantially change the socioeconomic profile of the study area. As described above,, the housing stock introduced by the proposed project would be similar in tenure, size, and affordability to the housing stock in the broader ¾-mile study area, indicating that the socioeconomic characteristics of the new population (e.g., in household income and household size) would not be markedly different from the characteristics of the population living in the broader ¾-mile study area. Furthermore, a comparison of the anticipated income distribution for households introduced by the proposed project to the current (2000) and future (2016) income distribution in the ¾-mile study area indicates that shifts in the distribution of households across income brackets would be small and would not substantially affect the overall socioeconomic character of the study area. Actually, the new housing stock would not be the same size. Would it be similarly affordable? It didn't look that way to me. As to whether the shifts in income distribution would not "substantially affect the overall socioeconomic character," well, would a 19% increase be meaningful? As shown in the Draft Supplementary Environmental Impact Statement issued at the end of March 2014, the socioeconomic profile has already shifted significantly. Notes: 1. Dollar values are presented in constant 2011 dollars. Household income bands are based on 2007– 2011 ACS data. Income bands were grouped to best match the income bands that would be applied to the Phase II affordable housing units developed under the Extended Build-Out Scenario. 2. Assumes that 80 percent of these units exclusive of the Phase I units (6,166) would be market rate and 20 percent (1,541) would be affordable, and that approximately 76 percent of the Phase I units (1,443) would be market rate and approximately 24 percent (479) would be affordable. Assumes that the income requirements for affordable units built in the future in the study area would be similar to the income requirements for the Project’s affordable (see Table 4A-10). The information presented in the Future Without Phase II columns does not account for the potential for future increases in the income levels of residents in existing residential units in the study area. Sources: American Community Survey 2007–2011 Five-Year Estimates; February 2013 Consumer Price Index for New York-Northern New Jersey-Long Island, NY-NJ-CT-PA Area; Forest City Ratner Companies (FCRC); AKRF, Inc. Though the Final EIS in 2006 predicted that, without Atlantic Yards, the percentage of households in the lowest income band would be 18% by 2016, the share had already dropped to 13.5% by 2011. The second lowest income band was estimated to be 14% by 2016; it's already 11.2%. The next highest income band was estimated at 5%; it's now 3.5%. The next highest income band, from $35,000 to $59,999, was estimated at 22%; it's dropped to%. The next highest income band, from $60,000 to $74,999 was estimated at 10%; it's dipped to 8.9%. The next highest income band, from $75,000 to $99,999, was estimated at 10%; it's nudged up to 12%. In the top income band, households earning $100,000 or more (which now includes some eligible for subsidized units), were estimated to represent 21% of the total in 2016. Instead, they make up 34.5%. Yes, there's a difference between using constant 2011 dollars, as in the current study, and 1999 dollars, as in the previous one. But it's clear that the disproportionate growth among the wealthiest cohort exceeds what was predicted. It's a reminder that these exercises, however steeped in statistics, can be quite inexact. And that gentrification far outpaced what was officially expected.